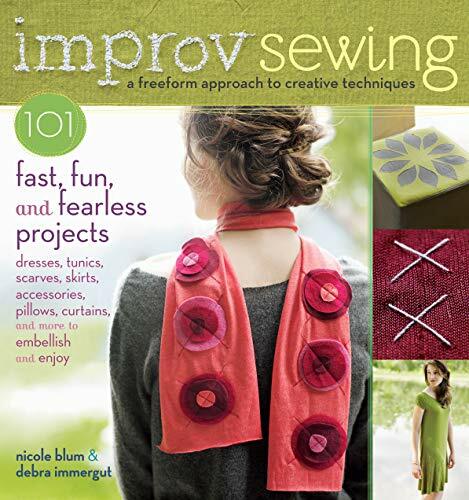 Free your creative sewing instincts with 101 projects that invite you to try everything you can imagine doing with fabric and thread --- from doodled stitches to stacked applique. There are no patterns here and hardly any rules. Simply choose your fabric (forgiving, stretchy knits work great), take a good set of measurements, and begin sewing. Nicole Blum and Debra Immergut provide five basic clothing designs that become templates for dozens of stylish dresses, tunics, skirts, and tops, all waiting to be embellished as you like. From a ruffled sundress adorned with ribbons to a flattering t-shirt doodle-stitched with a pebble pattern, this is soft, casual clothing you'll love to wear yourself or personalize for friends and family. In addition to dozens of wearable projects, you'll find stylish decorative items for every room in your home. From pillowcases and duvet covers to tea towels and placemats, many of these projects can be completed in an hour, and you'll be using them and enjoying their good looks for years to come.